This is a wonderful story out of the University of Wisconsin where 23 year-old student Brittany Falk is interviewing and writing the life story of 97 year-old Jean Hamm. Falk is taking on this project as a part of a course she is currently enrolled in at the college called Life Stories Legacy. When complete the life story that Falk writes and prints for Hamm will constitute about 30 pages. One Generation Learning From and Appreciating the Other. There is something special, I think, when you see individuals that are far apart, in age, work together. Often the older generation feels that no one cares much about what they may have to say. The younger generation, typically, doesn't realize the importance of learning from the experiences of other, especially life experiences. They don't realize, until usually year later, that they will someday kick themselves for not asking more questions while their loved ones were still around. "I think it's a way for me to develop my skills as a writer ... but in a way that I can connect with someone else, learn a lot about someone else's experiences in life. I've actually come to know that Jean and I are lot more similar than I would have ever imagined." To find out more about this University of Wisconsin project and watch a nice video piece, go here to view the original story. 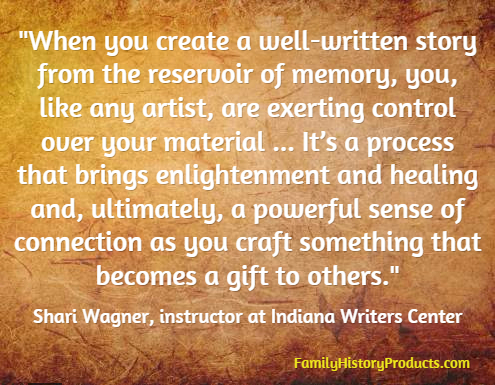 Shari Wagner of the Indianapolis Writers Center heads an amazing project where twice a month female veterans gather together to write about and share their war experiences through story, prose and poetry. Working in a group and meeting regularly is a powerful and helpful way to write about one's life. From a practical standpoint I think is is important not to let the thought of writing about one's entire life overwhelm us. Taking just a prominent event or concentrating on a certain time period in our lives and writing about it is a great way to get started. "When you create a well-written story from the reservoir of memory, you, like any artist, are exerting control over your material." "It’s a process that brings enlightenment and healing and, ultimately, a powerful sense of connection as you craft something that becomes a gift to others." The original story can be read here.